Johnston Press has today reported half-year revenues of £218.6 million – down 25.4 per cent year-on-year. Print advertising revenue fell by 33.5 per cent; while digital advertising revenues also declined – by 18.8 per cent. The publisher’s revenue from employment advertising was down by 53.8 per cent, property ads by 54.2 per cent, motors by 29.3 per cent and from other classifieds by 11.5 per cent. The company’s interim report said ad revenues were down 32.7 per cent in the first six months of 2009 compared with the same period in 2008. In an attempt to improve their digital recruitment sites and therefore their appeal to recruitment advertisers, Johnston Press has entered into a joint venture with Daily Mail & General Trust, giving them access to the latter’s Jobsite software. The report also expresses the group’s struggle ‘to compete with the regional activities of the publicly funded BBC digital presence’, claiming that it ‘distorts the markets within which they operate through making the charging for news content extremely difficult’. maintain our focus on costs and look to secure operating efficiencies during the second half of the year,” said CEO John Fry in the report. Yesterday the publisher celebrated success after it was announced that it had attracted the most unique users, to its network of regional newspaper websites, in the first six months of 2009. The publisher, which is responsible for more than 323 websites, recorded 6,864,820 monthly unique users on average over the period, according to the Audit Bureau of Circulations Electronic’s six-monthly report for regional newspaper groups. This entry was posted in Newspapers and tagged advertising revenues, Audit Bureau of Circulations Electronic, BBC, CEO, Daily Mail, Daily Mail & General Trust, digital advertising, digital advertising revenues, employment advertising, GBP, Interim Results, John Fry, Johnston Press, print advertising revenue on August 28, 2009 by Nora McKeogh. Dennis Publishing‘s latest Audit Bureau of Circulations Electronic (ABCe) figures have been released highlighting a growth in popularity for the publisher’s digital titles. 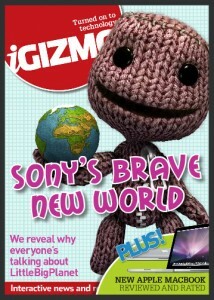 Dennis’ iGIZMO, which was launched in February, attracted an average of 101,785 unique users per fortnightly issue over the last year, a press release from the group said, while weekly title Monkey recorded 283,541 unique users on average and 1,009,298 for September. The latest figures show a fourth successive rise in ABCes for Monkey, according to the release. Fortnightly magazine iMOTOR’s issue average for unique users was 108,622 – 221,739 in September’s figures. These audits prove that the digital magazine sector is a viable, growing and successful business model. In addition, these titles are really delivering for our advertisers,” said Bruce Sandell, head of NPD at Dennis, in the statement. This entry was posted in Magazines, Traffic and tagged abce, Audit Bureau of Circulations Electronic, Bruce Sandell, Dennis, Dennis Publishing, Dennis Publishing Dennis Publishing, head, head of NPD on October 30, 2008 by Stuart Goodwin. Guardian News and Media (GNM) has become the second publisher to officially sign up for the Audit Bureau of Circulations Electronic’s (ABCe) six-monthly web traffic audits, according to a release from the bureau. The new audits will provide detailed daily, weekly and monthly breakdowns of unique user/browser and page impression figures for sites within GNM’s regional portfolio, which have previously reported web traffic stats on an ‘ad hoc’ basis. Regional GNM sites getreading.co.uk, manchestereveningnews.co.uk and manchesteronline.co.uk , as well as thejobsmine.co.uk will be analysed as part of the new arrangement. Online traffic data will be presented alongside print circulation figures for the titles, the bureau added. GNM follows Northcliffe Media, which signed up 10 of its regional websites for the new certificate earlier this month. In a press statement accompanying the announcement, Northcliffe said it plans to increase the audit to 20 sites by 2009, and to cover ‘all major urban and regional sites’ in the future. This entry was posted in Traffic and tagged abce, audit bureau of circulation, Audit Bureau of Circulations Electronic, guardian, Northcliffe Media, reported web traffic stats, traffic audits on September 30, 2008 by Laura Oliver. According to O’Donnell, further research will be conducted soon, as the group’s digital audience continues to grow. Sales staff training on how best to use the figures collected by the research will also be implemented – with particular attention paid to the difference between stats for ‘adults’ and ‘unique users’ to the sites and how behaviour differs amongst print and online consumers. This entry was posted in Traffic and tagged audit bureau of circulation, Audit Bureau of Circulations Electronic, Guy Lipscombe, internet-users, managing director, online consumers, Readership, regional, research, Sally O'Donnell, strategic marketing manager, Survey Interactive, Trinity Mirror on September 25, 2008 by Laura Oliver. The Guardian has admitted it mistakenly bought the keywords Madeleine McCann from Google. By wrongly purchasing the keywords a link to the paper’s coverage of Madeleine’s disappearance appeared in a column of sponsored results when a search for her name was made on Google. The newspaper has now taken down the link and has reviewed the list of keywords it owns, Marc Sands, marketing director for the Guardian, told Journalism.co.uk. The paper’s purchase of the words Madeleine McCann was criticised by Justin Williams, assistant editor at Telegraph Media Group, on his personal blog, who said the practice showed the paper was ‘desperate’ to hold onto its position as the UK’s most popular newspaper website according to the most recent Audit Bureau of Circulations Electronic (ABCe) traffic figures. “The purchase of terms is a way of getting your stories, at a cost, in front of people. It’s absolutely what everyone does all the time,” said Sands. [advert]A search for the terms shows the Mirror currently owns the keywords McCanns cleared, while a Google search for other keywords, such as Cristiano Ronaldo, show the the Sun and Times have also purchased phrases from Google. “It is a way of getting it [news] distributed to people who have expressed an interest in that subject,” he added. The practice had been criticised in the blog post, he said, because of the Guardian’s previous stance on the coverage of the McCann story. The issue led the paper to review its list of current keywords to assess ‘what news is okay to do it with and what isn’t’, he said. The Guardian buys thousands of Google keywords relating to current news stories every week, he added. It currently owns the keywords ‘stamp duty’, ‘university league tables’ and ‘post office closures’. “Madeleine McCann slipped through the net. You don’t approve all these [keyword purchases] every day. We would have had to say to the company that buys the keywords for us: never buy the keywords for Madeleine McCann,” he said. Search engine marketing and search engine optimisation of newspaper websites is a ‘new area’ for publishers, added Sands. This entry was posted in Search and tagged assistant editor, Audit Bureau of Circulations Electronic, Cristiano Ronaldo, director, director marketing, google, Journalism.co.uk, Justin Williams, Madeleine McCann, Marc Sands, Marketing, search engine, search engine marketing, search engine optimisation, Telegraph Media Group, The Guardian, United Kingdom on August 8, 2008 by Laura Oliver. 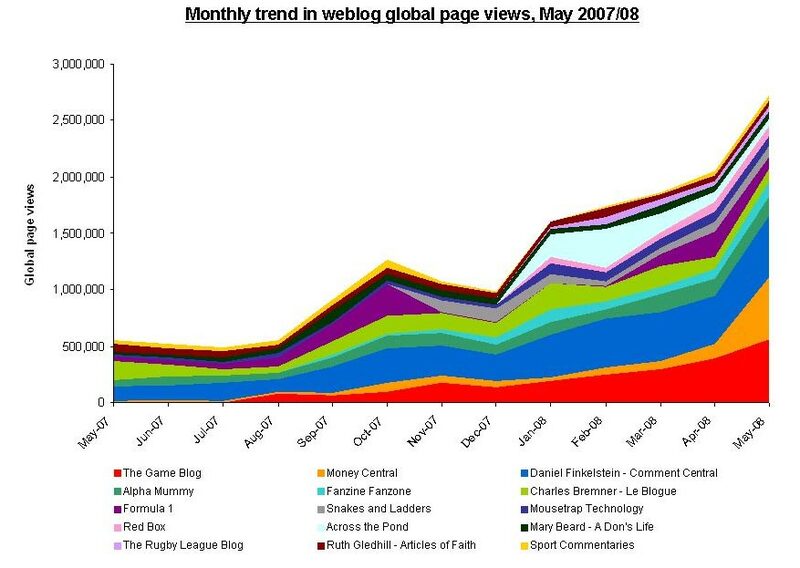 Global page views of Times Online’s blogs rose past the 2.5 million mark in May this year, according to figures from the publisher – an increase of 500 per cent compared to May 2007. As you can see the top three account for the majority of the blogs’ traffic. Figures for TimesOnline’s page views from May’s Audit Bureau of Circulations Electronic (ABCe) report suggest the site recorded 117,826,926 page impressions. These stats therefore suggest blogs accounted for roughly 2.12 per cent of the site’s total page views. This entry was posted in Traffic and tagged 202 Mousetrap Technology, 94, alpha, Audit Bureau of Circulations Electronic, blogs, Charles Bremner, correspondent, Daniel Finkenstein, Formula 1, Paris, times on July 29, 2008 by Laura Oliver. The Joint Industry Committee for Web Standards (JICWEBS) has completed the first stage of its review of how data is analysed by the Audit Bureau of Circulations Electronic (ABCe) in its audit of newspaper website traffic. One suggestion is to include all newspaper domains that contribute to the monthly traffic figures in the ABCe reports. The review is ongoing with further reports expected in November. This entry was posted in Editors' pick, Newspapers, Online Journalism, Traffic and tagged Audit Bureau of Circulations Electronic, Joint Industry Committee for Web Standards on July 18, 2008 by Laura Oliver. The Shropshire Star recorded 1,630,103 page impressions in April, according to the latest figures from the Audit Bureau of Circulations Electronic (ABCe). The figure rose by 59 per cent from the last audit of the site in November 2007 and 103 per cent year-on-year. In April the site attracted 114,388 unique users – a 14 per cent increase over the five months from November. On average the site recorded 6,942 unique users and 54,337 page impressions per day. According to a release from publisher Midland News Association (MNA), the figures coincided with ‘a bumper harvest’ of user-generated content on the site following sudden snowfall in the county. This entry was posted in Newspapers, Traffic and tagged Audit Bureau of Circulations Electronic, last audit, Midland News Association on June 18, 2008 by Laura Oliver.